Hello and Happy Friday! I hope my US readers enjoyed a lovely Thanksgiving amongst family :) Meanwhile a friend of mine requested an evening bag with a bit of sparkle. 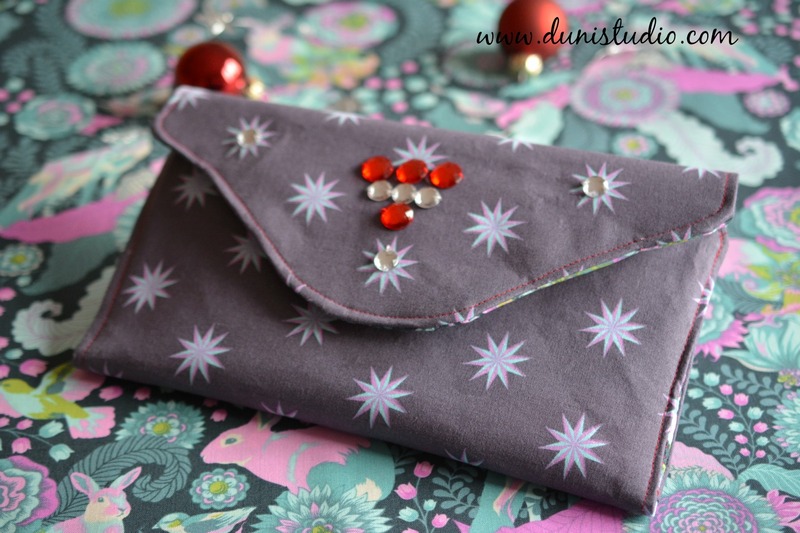 After sketching a few designs I came up with this one-of-a-kind envelope style clutch in a subtle grey with vintage star pattern. Hallo und guten Morgen, Mädels! Eine liebe Freundin wünschte sich ein Abendtäschchen. Sie sollte schlicht sein, aber dennoch elegant wirken. Nach ein paar Überlegungen und Skizzen ist nun diese originelle Clutch in Sanftgrau mit Vintage Sterne Muster entstanden. 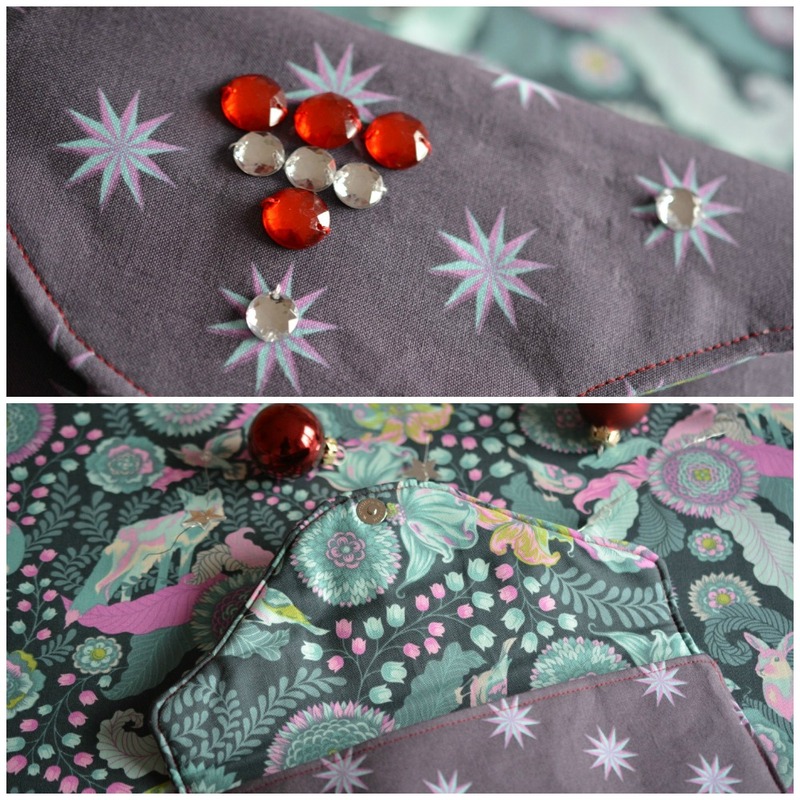 I embellished the flap with sparkly sew-on beads in festive red and crystal colour. These were kindly provided to me by Union Knopf. Thanks a bunch! I think they are really eye-catching, don't you? The bag opens/closes with a magnetic snap button and measures 9.5 x 6 inches. Die Taschenklappe habe ich mittig mit flachen Glitzerperlen in Rot und Kristall verziert. 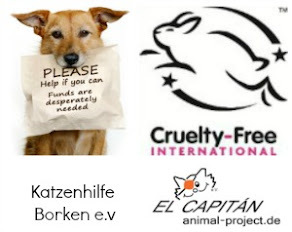 Diese sind Teil des großen Weihnachtspakets von Union Knopf. 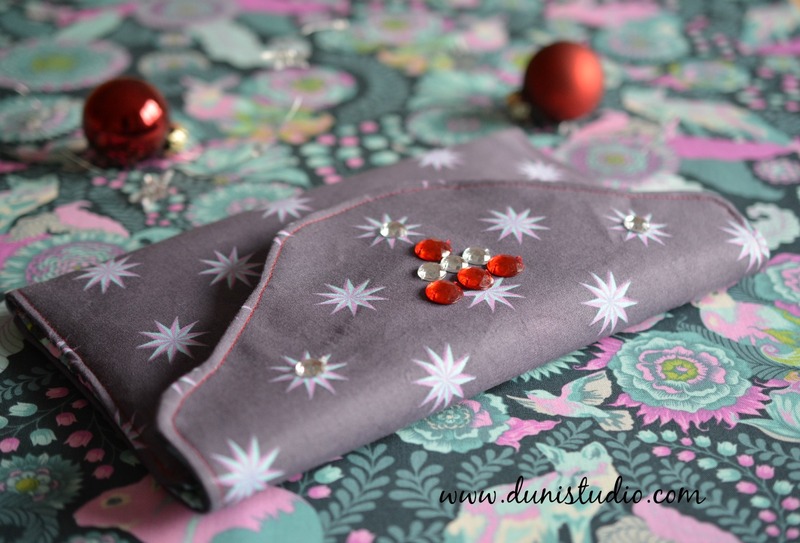 So wird die schlichte Clutch zum Blickfang! diese Clutch ist wunderschön geworden. Mir gefällt der Stoff innen und außen ausgesprochen gut und auch die Verzierung wirkt sehr edel. What a lovely clutch! The fabric on the inside is fantastic, I love all the animals that are hidden in it. 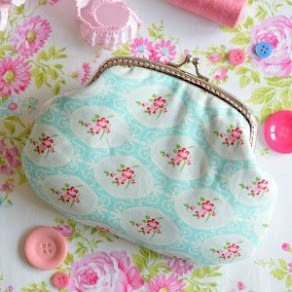 Beautiful bag Duni! I bet she loved this evening purse! die Clutch ist wunderschön geworden, Deine Freundin wird sich sicher sehr darüber freuen! Ich wünsche Dir noch einen schönen Nachmittag und ein schönes gemütliches 1. Advent-Wochenende!! The clutch is so sweet. I love the contrasting fabric inside. Very pretty! I love both fabric choices! So sweet! I have to admit I was a little surprised when I saw you post title because I don't really associate you with sparkles, but the clutch is great and seems totally "you." I'm sure your friend loves it! A clutch very perfect for the holidays. I love that the colors did not exhibit the typical Xmas colors of red and green. Te combination of brown, white and bead sparkles provided that holiday feel. 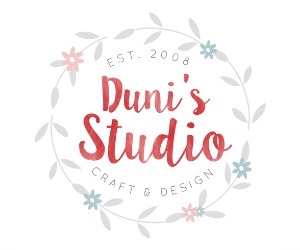 Another showcase of great creativity and craftmanship Duni! ein wirklich tolles und liebevolles Geschenk für Deine Freundin. Ich habe einen Rock in ähnlichen Farben, der erinnert mich gerade daran. Das Innenmuster könnte auch nicht besser dazu passen.